"Erected way back in 1865, Jhira Bagh Palace is an amazing heritage hotel for tourists who love splurging on luxury. A cozy environment is what this property has to offer to its guests who get to stay in spacious luxurious rooms and suites. 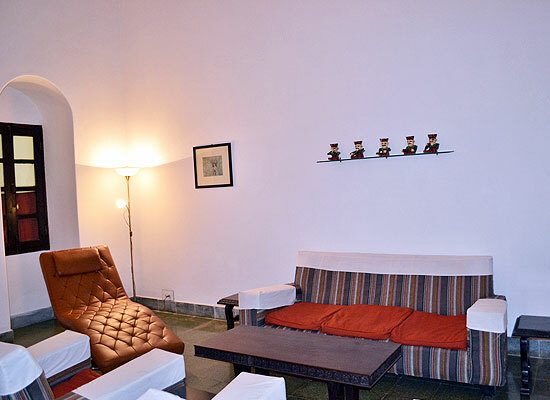 Spread amidst a vast piece of lush green land in the calm Malwa countryside, this palace is a perfect place to enjoy a relaxing vacation and visit the best attractions of Madhya Pradesh. 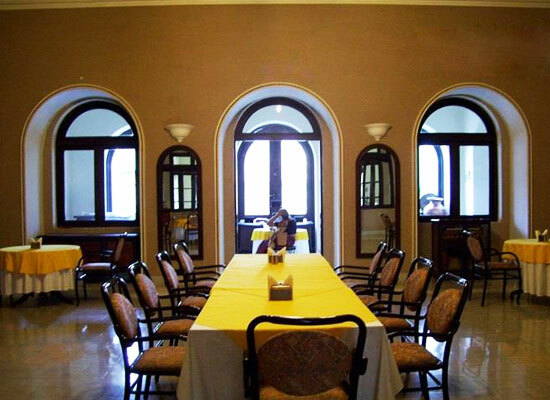 Enjoy world-class facilities and impeccable hospitality services in one of the heritage hotels of India. 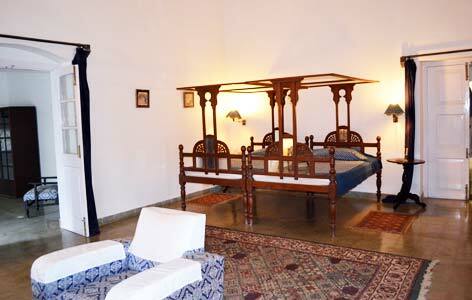 Jhira Bagh Palace Dhar was commissioned by Anand Rao Puar the Third, the Maharaja of Dhar during the 19th century. It was originally a British guest house for the VIP’s who visited the state. 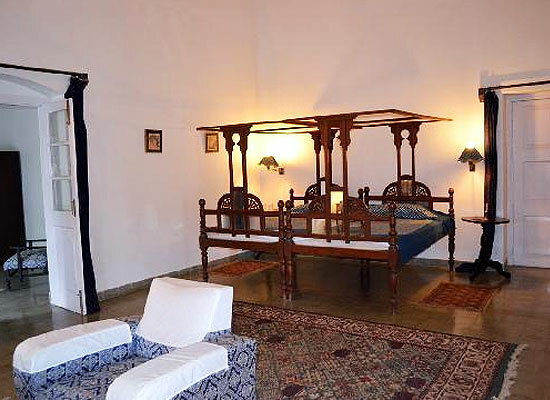 It has been accommodation option of various dignitaries like Lord Curzon, Governor General during the British Raj and Pandit Jawahar Lal Nehru, the first prime minister of India. In 1943, Gregson, Batley & King have designed the new architecture on the lines of the art-Deco and Bauhaus School of the new building after which the property got its new sophisticated look. Deluxe Room: Having an option of AC and non-AC accommodation, these spacious rooms have an-18 foot high ceilings, period décor, antique beds, couch settee, wardrobe, a work desk, election safe and much more. Deluxe Suite: These air-conditioned spacious suites with 18- foot high ceilings have antique furniture and period décor in its separate Bedroom and living room section along with a verandah, work desk safe and so on. Super Deluxe Suite: These spacious air-conditioned 18 -foot high suites, is front facing with an easy access to the courtyard and the dining hall. It has a separate living room and a bedroom with anticipated interiors and furniture, a private sit-out, hand-carved bed Wardrobe etc. The property has a spacious and airy dining hall where the guests can enjoy multi-cuisine delicacies prepared by the expert cooks. The dishes are prepared at the palace Kitchen where only organic ingredients grown at the property’s farm or supplied for the dairy are used. Get pampered by the impeccable hospitality services of the well-mannered staff during lazy breakfast at the lounge, meals in the central dining hall or a romantic dinner at the courtyard. Dhar is a historic town on the way to Mandu, a popular fortified town in central India. Around 33 kms from Maheshwar and 32 kms from Mandu, it was the capital of Malwa before Mandu rose to importance. Quite close to the important rivers like Narmada, Chambal and Yamuna, Dhar is covered by the Vindhya ranged, starting from the east to the west.